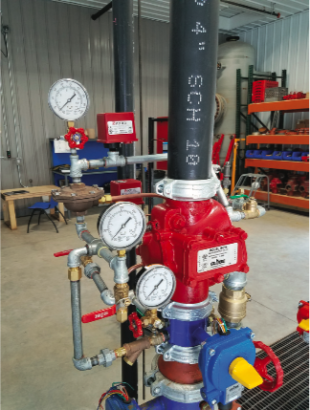 Globe's Karl Wiegand, a Technical Education and Research Engineer at Globe, contributed an Op-Ed to guide sprinkler installers on the merits of low Vs. high pressure approaches in dry systems. "High pressure and low pressure dry pipe systems both have advantages and disadvantages depending on the sprinkler systems in which they are being used. Individual sprinkler systems may have attributes that would favor either system.Typically, if the system is one where the direct route to the outlet requires a large portion of the system to be filled, a low pressure system is favorable. Conversely, if the direct route to the outlet doesn't require a large portion of the system to be filled, a high pressure system is favorable. It is important to remember with these systems that there is no "better" way. There is simply a way that is more appropriate for the situation at hand." Globe Fire Sprinkler is a family owned fire sprinkler manufacturer, headquartered in Michigan. We celebrated 100 years of continuous production of Globe Sprinklers and Valves in 2014; the Globe name has persisted in its enduring identity since the introduction of the first Globe Issue "A" Sprinkler in 1914. Globe developed the earliest lever-fulcrum dry pipe valve, Globe Save All center strut sprinklers, and eventually became the first US company to utilize 5mm and 3mm Glass Bulbs in its commercial and residential sprinklers. Its modern era began in 1988 with the guidance and dedication of Golden Sprinkler Award recipient Robert Worthington, P.E. until his passing in 2016. The Worthington family continues to own and operate Globe, under the leadership of Steven Worthington and a team of some of the industry's most seasoned professionals. Globe's heritage as a leading sprinkler manufacturer is reflected in the introductions of the RCW, UM, UMC valves, and other new products the company develops to meet the demands of the world market. The company proudly maintains strong relationships with approval authorities including Underwriters Laboratories Inc, FM Approvals and the Loss Prevention Certification Board (UK). Globe has the LPCB (UK) certification for ISO 9001:2015 series Quality Assurance, therefore exhibiting proof of the quality it continuously builds into each of its 100% factory-tested products.